There are several companies around the world who claim that they have great places for you to work, but there are times when employees do find out that the wonderful workplace they are about to enter will not be able to live up to their expectations. There are so many situations such as poor communication as well as general dysfunction that happen quite often. Small and big workplaces tend to show a large number of characteristics in that way. And in today’s post we are going to discuss the several qualities and characteristics of a great company has. Keep reading the post to find out what they are! 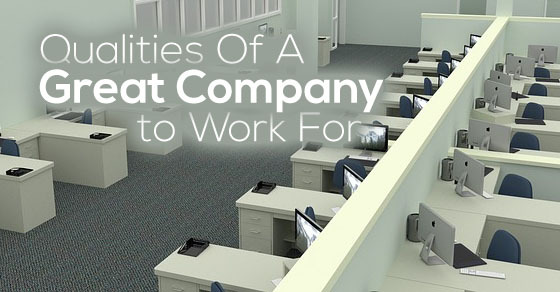 The following mentioned are few qualities and characteristics of a good company to work. We have always assumed that working in a big company always means having a better job. Most of us like to believe that jobs like this will also give us enough job security. However statements like these are not entirely true. If these huge organizations want to stay for a longer period of time, they need to have a good idea on how to work with other small companies. This also means that you have to move quickly, empower more people, change how they can manage things, get rid of all the ridiculous processes as well as rules and not let the legal stall take any chances. One of the best and most important qualities that you will find among these companies is that all of them communicate with one another regularly. Communication is in fact the best and only way to stay in touch with the people around you. Plus it is also a great way to stay together. If you want to work for a company that helps you learn, share and grow, you must always choose one where people communicate with one another on a regular basis. Those who talk freely have freedom of expression that is needed. These qualities are looked forward to. A third quality is that the company should be filled with all the right people. You should in fact be surrounded by those who are loving and passionate. Companies who tend to hire people on the basis of their work,resume and the experiences are not as successful as the rest. If you came to our company, we would hire you on the basis of your passions and not your experience. And any other company would do the same. The environment you work in should always be a fun one. People here should be happy, energetic and over open. Those who can help in making a big difference are the ones you really need. They will help in changing the whole atmosphere of the company you are working in. Everyone wants to be surrounded by people who know how to have a good time. If you can find a company that has all the right people in it, then there is nothing like it. A good workplace is one in which the community spirit is present. If you are among people who make you feel like you are a part of their team, then you certainly are in the right place. Employees must feel like they are a part of some group where everyone has the same feelings and thinking. This is what we mean when we speak of community spirit. A good company that has people who provide honest feedback is what everyone dreams of. Everyone wants to be surrounded by people who can give feedback that is real and sensible. If you ever find a workplace like this, don’t ever leave them. People like this are always hard to find so when you get a company that practises such a wonderful culture, become a permanent part of them and don’t leave whatsoever! You are in for great benefits after working with them. In order to become successful, the company should be motivated by a particular something that goes far beyond any financial success. Every owner and manager that you work with should be filled with love. They need to have a good idea about the business so that they pursue to work throughout the tough times. People who do businesses successfully tend to have owners, who are passionate about this, are willing to take up the business and encourage others to work harder. They should have a plan in mind, have goals already and should be having meetings regularly to keep the company going. Good companies are those that stay focused and have a good idea on what they can do well. When companies are looking for new ideas, they are often drifting into territories that are unknown and that get them into a whole lot of trouble. But good companies are certainly not like this. They have a familiar territory and they keep working on it, keep expanding it even more. Shutter fly in that way is a good example of one company that is always growing. They are working towards expanding their social business, helping people, sharing photographs in several ways. Niches may also be considered as fine markets. Small companies do not ever engage their people and associates into building and working on their business. They work on creation of ideas through delivery. Ideas do not ever just come to them. They also come bottoms up and from almost every direction. Everyone who works in a company tends to feel that they do own a little piece of the action and are also accountable to how the company has been working. The inspiration also comes from a company that has good leadership skills, starts right from the top, goes deep into what they do and focus on getting good results. Having good attitude and ethics is also important in almost any company that you work for. In order to make your business successful, all business owners must be having the right attitude. Without this, it is absolutely impossible to motivate people and push them forward. Finklestien had once said that a successful business is one that depends on the people that we work with. These people should not just possess the right attitude but must also be able to work easily with others. Apart from that, you have to stay positive. Successful business owners are those who have to be ethical. Though it is easy to make short term decisions that are unethical, they don’t realize that the integrity of the entire company is hurt and at the same time makes them unhappy and unsuccessful. In order to become successful, most businesses also have to commit their resources and make some time in order to train their employees. They must also have independent contractors with whom they can work freely. Experts have also said that every company needs the right amount of training in order to become successful. For this they must have assignments on a regular basis where they can train people as well as operations of different sorts. If one assessment uncovers a weak area, businesses will have to address this and revise their methods once again. Company culture can only become successful if they have a sense of commitment. People who work together and are committed to achieving a goal are always going to be more successful than others. Most importantly, those company cultures that have successful businesses are able to have a sense of commitment as they work towards it. Satisfying all your customers needs a whole lot of attention along with execution. When you are building the company, you have to make sure that the people are helping one another, this help business become a successful and not a failure. But always remember that execution is not simply about delivering a product. It is also about having the right service. Over the past few years, I have also observed the right technology companies who don’t know how to organize and respond to the needs of the company and the services end up getting bad results. The company you want to work with should also have good leadership as a part of their business. In order to make a business thrive, leadership thrive. The person you work with should be engaged, accountable as well as performance driven by paying more and better attention to all the businesses. In that way it is also quite easy to identify the right owners who are so engrossed in their leadership work so that their business is free and floating with direction. This is also equivalent of trying to run a business by using a remote control. Success is often a result of having enough knowledge, being able to master those skills by using the knowledge and making the best of the abilities you have. A commitment of your training as well as education is non negotiable for technical as well as non technical development of skill. The ultimate measurement of the commitment of the company can only be done by education and training and the result that is found within a period of ninety days. Skill development is one investment of your brand as well as quality assurance. And getting better at is the value of the company. Another good characteristics of a good company is one where people care about one another and most importantly respect each other. Having respect is obviously a very important thing if you have enough of it in your company, you can expect it to climb the stairs of success with ease. Ask people who have such an environment in their company and see if they have excelled. Their answer will shock you! When it comes to selling, there is love and hate relationship almost everywhere. The love part will help the business do better and excel even more. People do understand and recognize this. The hate part can be summed up by the fact that not everybody and all people are comfortable with the whole point of selling. There are some people who are natural at this while there are some more who often find it hard when they are in close proximity with a situation that is associated with sales. The whole process of selling is just like producing another Broadway show. There are people like sound technicians, lighting, orchestra and most importantly there are actors. The success as well as the applause is earned by everyone’s hard work. At that point, the person’s role in the company really does not matter. The paycheck of the person is dependent on how much they can sell. With this, we would like to bring the post to an end. If you are planning to join a new company soon, speak to your friends who have worked in this company before and have all those qualities you are looking for. Nonetheless, in this post we have enlisted the qualities and the characteristics above. If you have enjoyed reading this post, do agree with us and have some nice comments or ideas in mind, please let us know in the comment box below. We are waiting to hear from you. On that note, good luck and here’s hoping you are always blessed with such an environment that helps you grow and learn new things every day.